Our tour of the DMZ took us about an hour and 20 minutes north of Seoul, to the 4km-wide uninhabited buffer between North Korea and South Korea. Barbed wire fences, guard posts, and mine fields stretch from coast to coast along the 38th parallel–a 248 km stretch of the most heavily armed border in the world. A brief overview of the history for those who, um, don’t remember: the division between North and South Korea is a product of Japanese occupation during WWII, when at the end, communist Russia and China were left as political advisors of the North and the democratic US was left as political advisor of the South. The Korean War began in June of 1950 when the North invaded the South, and ended in July of 1953 when a cease fire was agreed to by all parties involved. The DMZ was created as part of the armistice agreement, separating North and South Korea by 4 km of land (2 km for each side), with a military demarcation line running through the center–today this line can be seen by a trail of white posts and rusty signs which run the width of the Korean peninsula. Our tour, led by the USO, included Panmunjon (also called the JSA or Joint Security Area, where North and South Korean soldiers stare at each other across the demarcation line), several observation points looking into North Korea, a few ‘sites of incident’, and what’s known as the ‘Third Tunnel’, 1 of 4 tunnels the North Koreans have dug into South Korean territory–there are suspicions of at least 10 in total. The most interesting part of the tour was our time spent at the JSA, where we were allowed into the blue temporary buildings that sit between two concrete behemoths on each side of the border. While the buildings are temporary, they have been there for decades, an emblem of the unresolved war between North and South Korea. This is where the armistice agreement was signed way back when, and where talks between the two countries continue today, with slow and nominal progress. 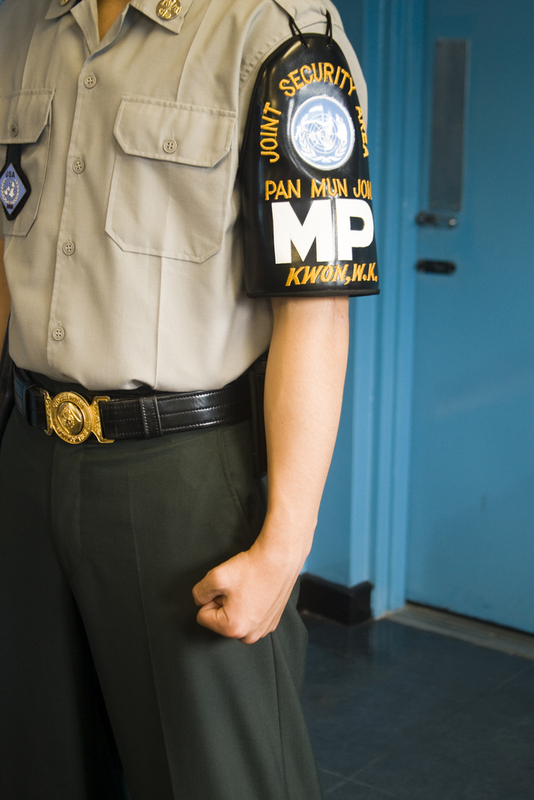 Here, the ROK (Republic of Korea) military police stand facing North Korean soldiers, in a ‘fight me’ stance, with fists clenched and an expression that gives nothing away behind dark sun glasses. While we were on a tour, these men were not there for show–they were on duty, and we tourists were reminded not to interrupt or distract them as we snapped photos and stepped from 1 half of the room, which was South Korea, into the other half of the room, which was in North Korean territory. 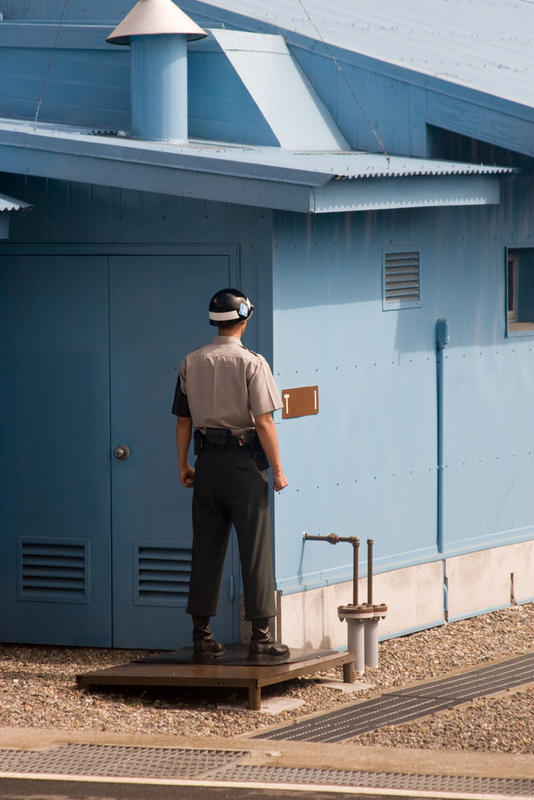 The ROK police stand peering out from behind the blue buildings (to reduce their size as a target) as well as out in the open, while the North Korean soldiers return the gaze from their respective perches, all of them engaged in an ongoing face off across an invisible border without any foreseeable end. South Koreans are not allowed on this tour without special permission from the government, which first entails a background check that goes back 4 generations. It’s a nuisance, so most South Koreans have never been and perhaps don’t want to go as they hear about the DMZ frequently on the news. The division and the ensuing tension has become a part of their lives, as evidenced by the containers of gas masks located in every underground metro station. But the presence of these things is not as dire as it sounds; the gas masks are like fire extinguishers–there in the case of an emergency without much likeliness of use. During the tour we could look into North Korea. At one observation point, an auditorium with raised seating has been built looking out onto the North Korean horizon through a huge plate glass window. It felt strange to gaze upon a landscape this way, and in fact, it didn’t feel much like looking at a landscape, but at a giant postcard of a mysterious and forbidden no-man’s land, not real and full of intrigue. 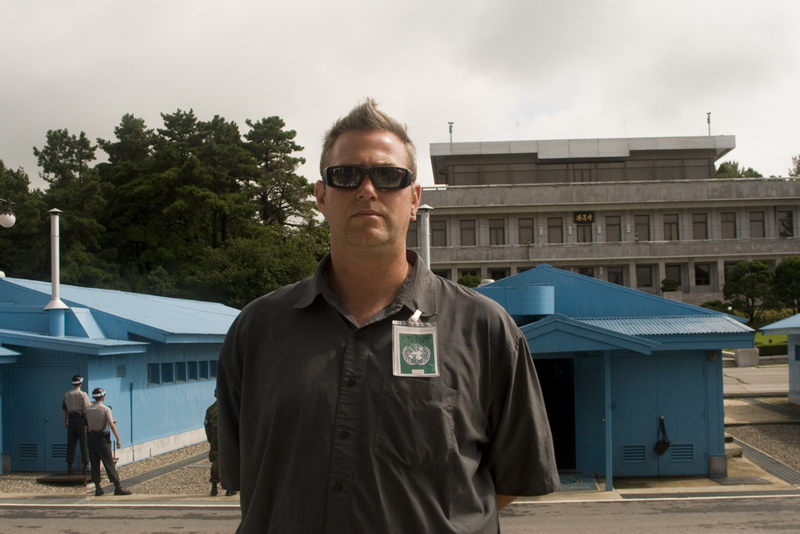 The military built this place to watch the goings on in North Korea across the DMZ buffer… on the lookout for gathering military forces or any other unusual and suspicious activities. 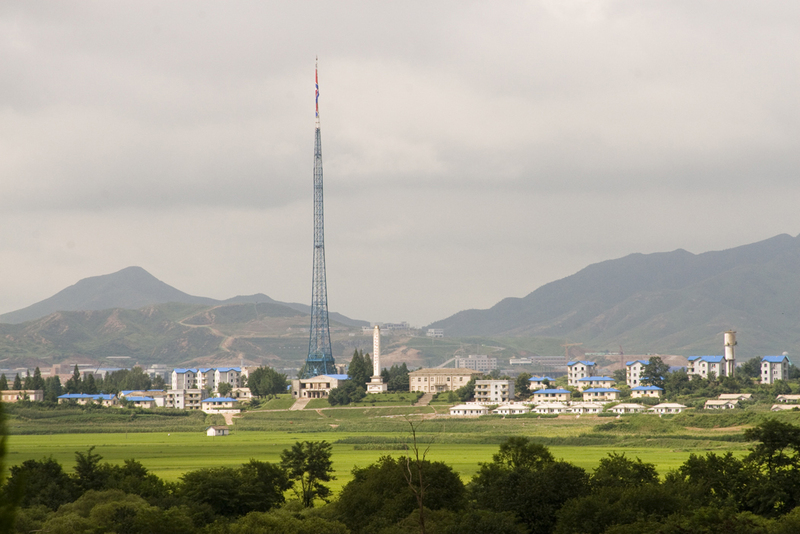 From another observation point closer to the JSA, it’s possible to see North Korea’s ‘Propaganda Village’ so named by the South for the loudspeaker broadcast of messages proclaiming the greatness of the country and invitations for defectors to come to ‘Paradise’, the North Korean name for the village. The broadcasts have stopped, but the name has stuck, and those who spoke of the place don’t believe anyone actually lives there as the lights seem to come and go off as if all controlled by the same timed switch. There’s also a village on the South Korean side. 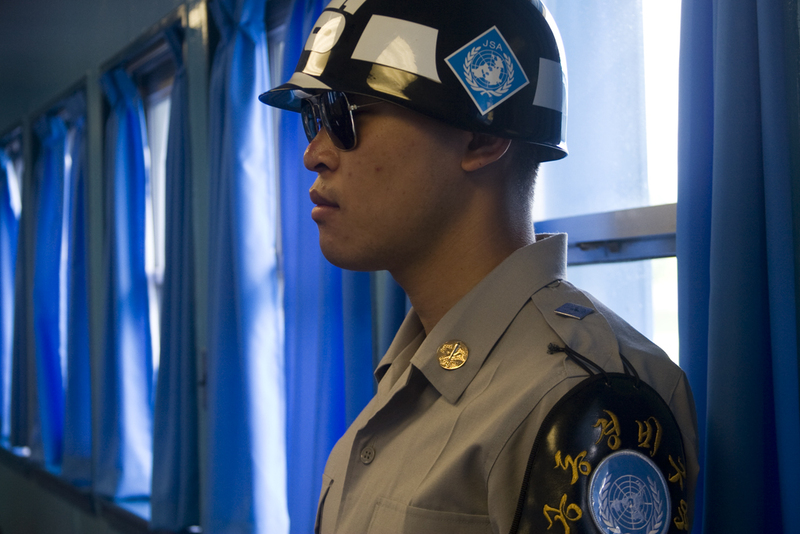 When the armistice was signed, both the North and South were allowed to have 1 village in the DMZ as the whole thing was supposed to be temporary–the idea was that these villages would establish some ‘normalcy’ to the area when the country was eventually reunified, an event still waiting to happen. The South Korean village is full of farmers who make a hefty, tax free income on the rice and chili peppers they grow in the fertile Panmunjon Valley. And while they’re given special favors like no tax and exemption from military service, they live under curfews and armed guards. 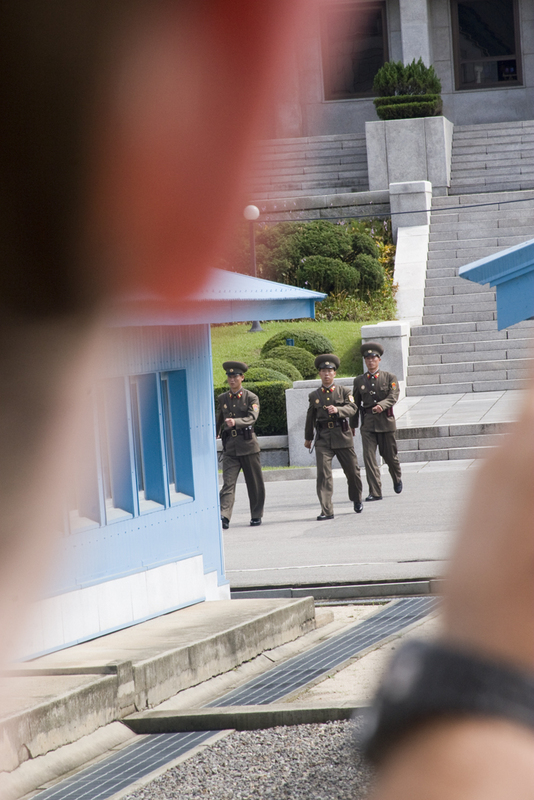 There is a lot of watching and a lot of waiting… for something, or nothing, to happen at the DMZ. It’s as tense as any ‘face off’ is tense, a supreme show of stubbornness on both sides–the DMZ itself a place unaffected by the decades that have passed since its inception, locked in a moment in time while on 1 side, a country progresses and on the other, a country withers–opposites connected by families that have been torn apart by the boundary and today hardly know each other. It was a strange honor to be allowed to visit and I wondered, at first, why they allow tourists into the depths of the DMZ, upon roads lined by mine fields and most surprisingly, upon enemy territory (albeit in the protection and confines of the JSA building)… but what better way to show the North what freedom really is? You are currently reading The DMZ at On the Road.